Forever Clarens Self-Catering Units - Clarens Accommodation. It offers four individual units that can accommodate from a romantic two sleeper unit to a full family unit for up to six people. We are able to accommodate 14 adults and 4 kids between our 4 units. Various activities are in close proximity including numerous hiking trails, trout fishing dams and for the golf enthusiasts the Clarens Golf & Trout Estate. Top quality restaurants, bakeries and delis are within walking distance. The convenience of staying at Forever Clarens enables our guests to experience first-hand, the many delights which Clarens has to offer while also providing a tranquil and relaxing setting with stunning views of the surrounding mountains. Forever Inspired is our romantic unit with the most spectacular views of the surrounding mountains. The unit is a tastefully furnished, L-shaped, open-plan and can accommodate up to two (2) guests. The unit features a sleeping area with a queen bed that flows into the sitting area, a spacious and modern bathroom with a free-standing Victorian-style bath, a kitchenette and a private outside "braai" area. This unit is popular for honeymooners. Forever Hopeful is an upmarket, tastefully furnished unit that can accommodate a up to two (2) adults and one (1) child / two (2) small children. It features a bedroom with a queen-size bed, a bathroom that is fitted with a bath and shower, a living area with a TV and a sleeper couch as well as a kitchenette. An additional charge applies for children using the sleeper couch; R250pp over weekends and R200pp during the week. Forever Blessed is a fully furnished unit that can accommodate up to four (4) adults and two (2) children. The unit features two (2) bedrooms, each with an en-suite bathroom, a large, modern kitchen, an entertainment area with an indoor "braai", and an open plan dining- and lounge area. The unit has been newly renovated and all rooms are modern and tastefully furnished. 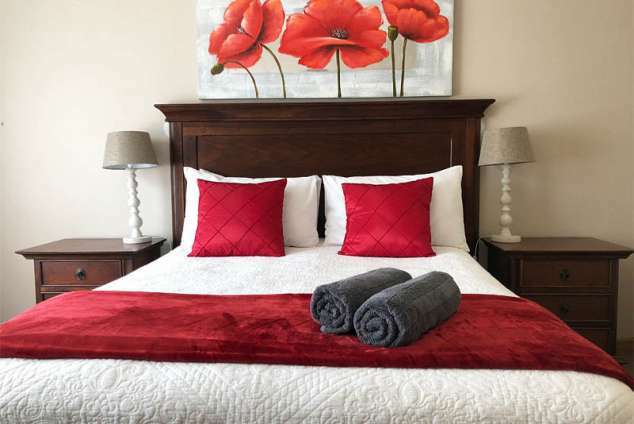 The bedrooms include queen beds with electric blankets for those chilly Clarens winter nights. Two additional single beds have been added to the common area accommodate two children at an extra cost. Forever Family is the original main house on the property with an anthracite coal stove for a warm atmosphere. It is a spacious, homely family unit. Facing northeast, you can view the sunrise from your bedroom, lounge or the indoor "braai" room. There are three (3) bedrooms, with a queen-size bed in the main bedroom, room two (2) offers twin beds, while room three (3) is ideal for a family as it accommodates a double bed as well as a single bed. Beds are fitted with electric blankets. The house also offers two (2) full bathrooms (one en-suite), a kitchen with a scullery, an open plan lounge and dining area with an 8 seater table and an indoor "braai" room. 1286 page views since 11 Oct, 2018. Last updated on 25 Apr, 2019.